Welcome to Make It Monday with Kraft Outlet. Use this week's "Give Thanks", theme to inspire you to create your project and then link it up at the bottom of this post before 6:00 p.m. (Eastern Time) on Sunday November 13, 2011. All of our followers who participant in our challenges for the month of November have a chance to be featured on our "Feature Me Fridays" posts as well as be entered to win a $15.00 Kraft Outlet Store Voucher! The more challenges you enter this month, the more chances you have to win! My name is Debbie Marcinkiewicz and I am a wife and mother of two, wonderful sons! I am lucky enough to ‘work full time’ designing paper crafted treasures for several on-line boutiques and blogs currently! I have been a crafter all my life and have dabbled in just about everything. I owned my own sewing business for approximately three years in which I handmade American Girl doll clothes and quilts. It was a very natural progression to travel from quilting to paper crafting … the same basic techniques can be applied transitioning fabric to paper! I have been paper crafting seriously for approximately six years and have been professionally designing for almost two years!! I love anything vintage and shabby and adore to work with fabric, glitter, vintage images, textural embellishments … and enjoy using my sewing machine on my paper crafted designs!! 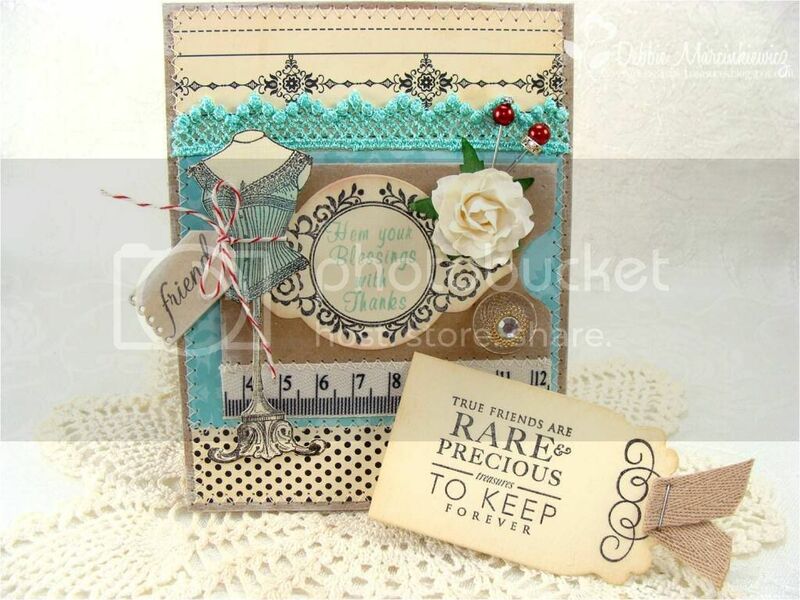 I really find so much joy in inspiring others through my tiny, made from the heart treasures! I find much of my vintage inspiration around my pink Victorian home, antiques I’ve collected for the past 25 years and in nature! I am tickled to have the opportunity to design with the fabulous items carried through the Kraft Outlet! Hello friends! 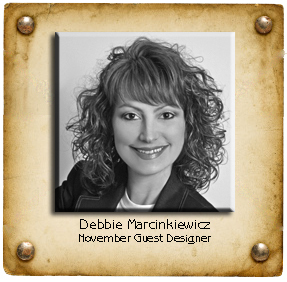 My name is Debbie Marcinkiewicz and I am delighted to have the honor of being Guest Designer here at The Kraft Journal for the month of November! I adore working with anything 'kraft-y', so creating with all the delicious goodness available at The Kraft Outlet is a match made in heaven! For this little card I first adhered some pretty patterned papers with a machine sewn zig-zag stitch to a piece of Lunch Bag Kraft Cardstock for the base of my card. I sewed a snipett of Ruler Twill Ribbon to a Card Sleeve Envelope, inked the edges with cream paint and adhered to the card base. Next I stamped the word 'friend' on a piece of Lunch Bag Kraft Cardstock and tied it around the stamped dress form image with Red Baker's Twine. Lastly, I stamped a couple more images onto some Buff Ivory Cardstock, die cut them and adhered one to the front of the Card Sleeve Envelope and slipped one inside the envelope -- added a piece of tea-stained twill tape as the pull. The addition of a pretty blossom, a couple Garnet Stick Pins and a pretty sparkler complete this design! I hope you enjoyed peeking at my design this week! I can't wait to show you another kraft-y project next Monday, so stay tuned and until then, happy 'krafting'!!! 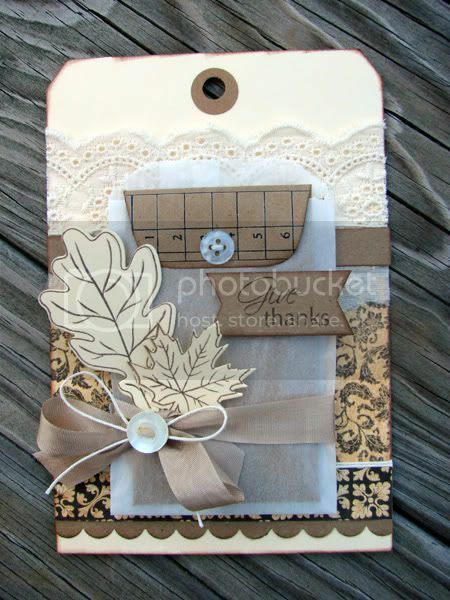 Kraft Outlet DT Reveal for "Give Thanks"
For this week's Give Thanks challenge, Audrey created a fun tag card using a Buff Scroll Postcard Shipping Tag and lots of her favorite goodies from The Kraft Outlet. She layered the background with patterned paper and strips of Lunch Bag Kraft Cardstock and added trim and Hang Tag String for extra detail. 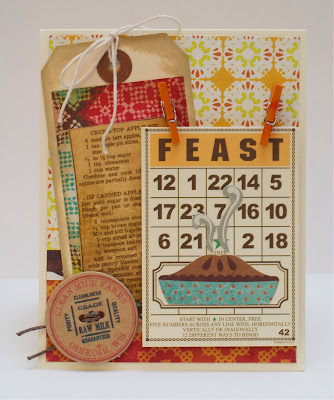 A Mini Lunch Bag Kraft Envelope tucked into a Small Glassine Bag forms a backdrop for a sentiment banner and leaves die cut from a Large Manila Shipping Tag. Audrey tied the bag up with Adelaide Seam Binding, Hang Tag String and a vintage button and added Paper Edges Rubbings to the mini envelope flap. Since the tag is also a postcard, Audrey can write a special message to a loved one on the back. For this week's "give thanks" challenge, Jennifer used a buff ivory card base and some gorgeous fall-themed papers as the backdrop to this Thanksgiving feast-themed card. The shipping tag was covered with patterned paper and a sticker with an actual apple pie recipe on it (she didn't try it though! ), and she added a pie die cut to the mini bingo card! 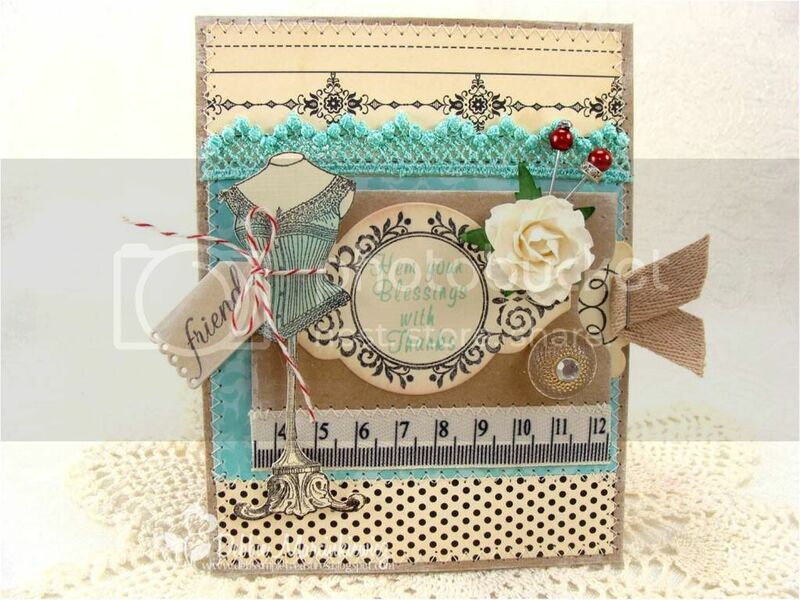 The card was finished with a milk cap chipboard button threaded with some hemp cord and two colorful mini clothespins. Head over to her blog for more specifics! 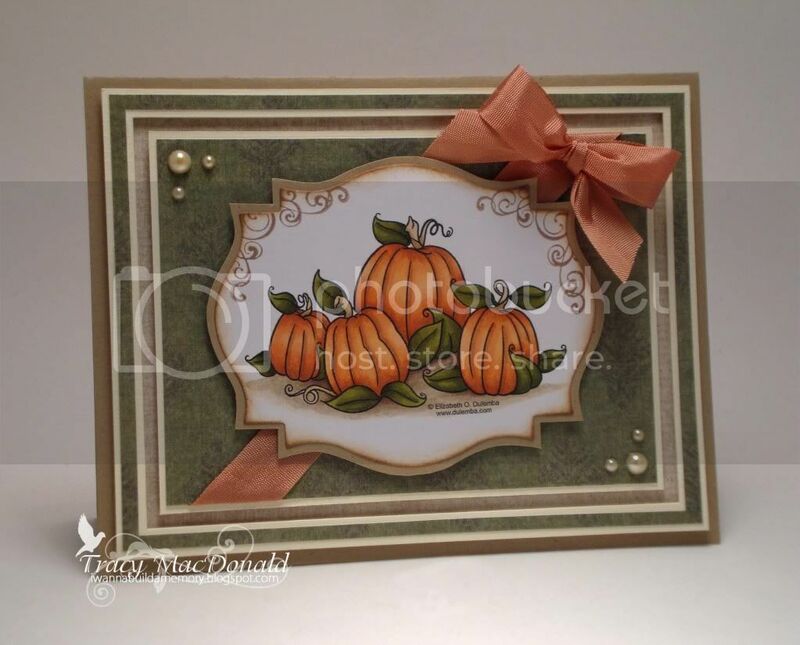 Tracy colored her pumpkin image with Copics, cut them out with a Nestie die, stamped around the edge of the image a little, and inked with Vintage Photo Distress ink. 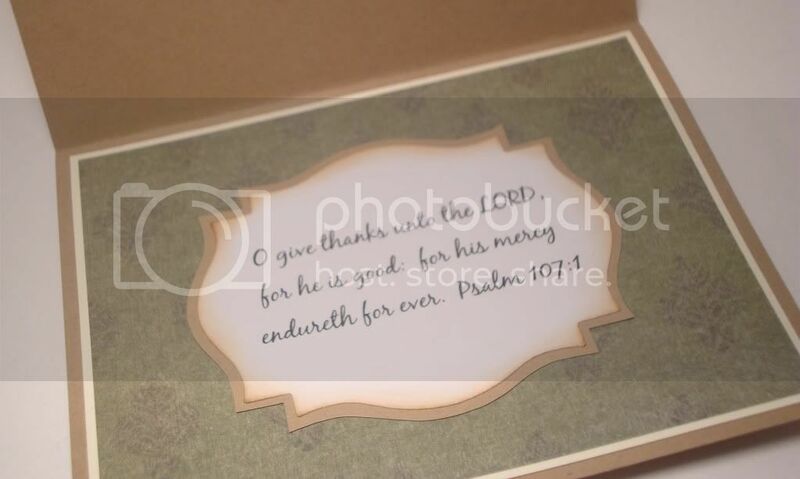 The image is matted on Brown Kraft cardstock and the base of the card is made from a Kraft Brown Blank Notecard. The green designer paper is matted on Buff Ivory cardstock and both the thin outer and center image panels are popped up on foam from the base of the card. She used some 7 Gypsies Savannah seam binding for the diagonal ribbon and bow and added a few pearls to the corners. Used Kraft for Hot Chocolate drink (thought it was perfect color to represent the hot choc) & swirls in my Hot Chocolate CAS Thank You Card. Beautiful projects by the DT! Great job!